The Lighthouse is an intimate cafe-bar-games-event space with cozy seating, exhibition spaces, live bands, DJs, great food & drinks menu, outdoor terrace and large spaces for parties & bookings. 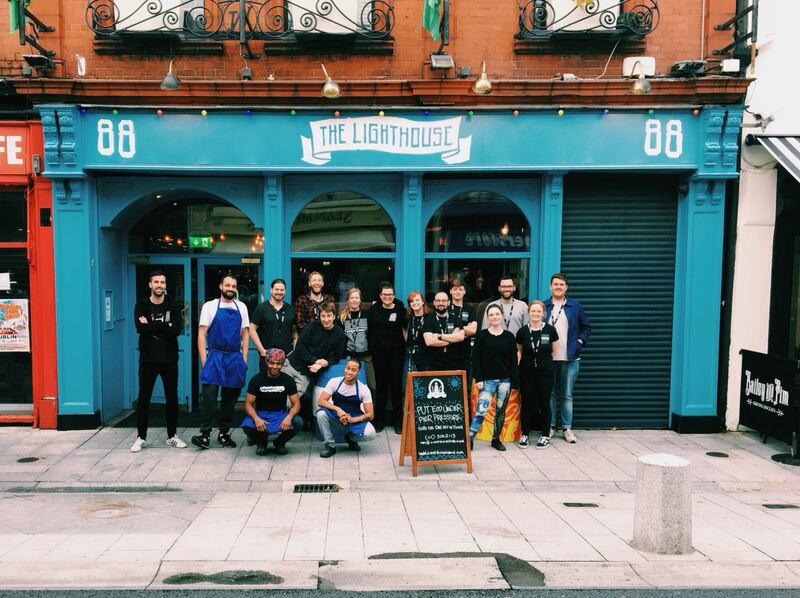 The Lighthouse is located on 88 Lower Georges St, Dun Laoghaire. We open Monday-Friday at 12pm[midday] and Saturday and Sunday at 11am. At the Lighthouse and across all our bars we take pride in creating delicious food & drinks menus. We always try our best to support organic, local, free range, sustainable & ethical food production & supply practices. Ollie who runs the famous Big Blue Bus will be sailing the ship kitchen at Lighthouse & anyone who’s been to the Bernard Shaw & The Back Page will know about his delicious grub. Take a look at our food menu here. Dockyard – where we get our bounty from [ ie some of our food suppliers ] : Toonsbridge Dairy, Love Leaf Wicklow, West Cork Buffalo Farm, Wooded Pig Charcuterie, Frank Doyles Butcher, Gortnamona Cheese, Wicklow Farmhouse Cheese, Cordella Foods & organic vegetables, Burns Butcher Sneem, Albertos Gold Spanish Produce, Lilliput Trading Co., Gubbeen Farm & Farmhouse Cheese & Dingle Ice Cream. When it comes to drinks we’re keen to support & try out local & new producers exactly the same as food. We’ve got coffee from the best roasters in Ireland, 3fe. Our wine menu is mainly curated and supplied by Tindals Wine Merchants. Our cocktails, beers & cordials are all chosen wisely & carefully by our in house Brewtonic team, which is the drinks arm of Bodytonic. We experiment all the time brewing our own beers, growing our own hops, conjuring up new cocktails, cordials & bitters, and work closely with Rascals Brewing, Hopfully and Grand Cru Beers too. A major area for us to explore in 2018, and for next year, has been our No-Low Alcohol drinks menu – both variations in beers, wines, tall drinks and cocktails and we have it in full effect at the Lighthouse. Take a look at our drinks menu here. We love games and we’ve got all sorts at the Lighthouse & this will grow even more over time. We have Ping Pong [3 tables], 6 arcade machines, pool table, bar games, Cards Against Humanity, and lots & lots of board games. We’ll have our weekly Ping Pong tournament every Wednesday upstairs from 8pm, Fridays & Saturdays are for games shows, bingo & quizzes from 9pm. Quizzes are a weekly event at The Lighthouse from Boozy Bingo to Peep Show, you name it, we do it. There’s always something on, music to bop to & general good divilment and banter. Families & pets are welcome at the Lighthouse. We’re not ‘kid friendly’ in the sense we are a cafe-bar-events space for adults first, but kids are welcome, as are dogs & pets on the ground floor level, but you must supervise them at all times. You need to have them all home by 7pm though otherwise there will be various associations onto ya, and us probably. The good news though is YOU can come back. Our menu for kids is located here, see the ‘Little Captains’ section, and we’ve carefully curated it, so its a ‘quality sourced food’ menu. We’ve riddles and drawing on the back of the menu, and all budding Picasso’s can drop the drawing to us, and we’ll stick it on our Arthouse walls, with a monthly winner being picked who gets to bring their whole family back for a meal and round of drinks, all on the [art] house on us!